Formula One's sole tyre supplier has announced the tyre compounds to be used in the first four fly away races, with the interesting choice being the aggressive selection for Melbourne and Bahrain with both having a two step difference between the tyres. The race in Melbourne starts at around 5 pm which is later than normal to ensure viewers in Europe are not too inconvenienced by an earlier start. This means colder track and air temperatures which mean longer warm up cycles for the tyres. The use of super soft as against the soft option from last year will help the tyres get up to temperature faster but it will result in a shorter first stint after the start of the race. There will be drivers trying to under cut the cars in front by pitting a lap or two earlier and then there will be the more risky driver willing to stay out for a lap or two longer than most others, read Sergio. Malaysia and its warmer temperatures and higher humidity with an abrasive track surface (not like Jerez) require the two hardest compounds on offer, but the high possibility of rain means there is every chance that teams will end up using all four tyre options available for the weekend, including the intermediates and full wets. 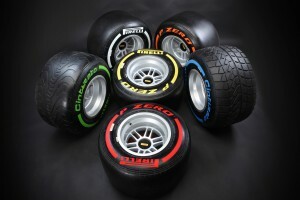 The tyre degradation in China is usually at a level between Melbourne and Malaysia. The temperatures are usually cooler than Sepang and most drivers complain of understeer on the hards while the softs provide decent grip. But with Pirelli having changed this years compounds to be a shade softer than last year, we can expect decent grip levels with the harder compounds as well. Bahrain sees very high temperatures and very changeable track conditions caused by the fine desert sand. The track is as technical as Malaysia and it has a mix of high, medium and low speed corners. Tyre degradation is pretty high here, hence the extra step from the Medium to the Hard tyre for the harder option. With a difference of 1 to 1 1/2 seconds between the two compounds we should see some interesting strategies come qualifying and race day. Very nice and crisp analysis. It would also be helpful if you could mention time zones while specifying times (ex: IST). Also, specifying a source would be welcome as this analysis involves a bit of news too. People will trust the information better with a legit source backing it up. Cheers and keep em coming! Nice analysis. Any ideas how much actual the weather variation on raceday might influence tyre choice?